This is another scratchboard that I did. 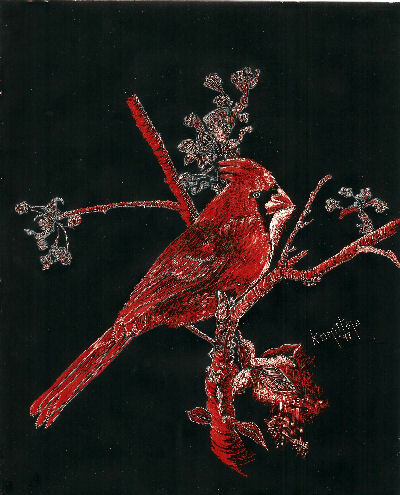 I have a fascination for birds and I enjoy drawing and painting them so I thought I would try my hand at a scratchboard drawing of one. A detailed pencil sketch of the subject was first prepared on tracing paper. Then the back side of the tracing paper was layered with a red chalk. The sketch was then transferred to the scratchboard using a stylus and a very light touch. The red chalk is reasonably easy to see on the black scratchboard. Sharp tools are then used to "scratch" out the highlights and bring the drawing to "life." This particular scratchboard had an underlying red layer under the black India ink layer.